Sunscreens have become an important part of my 'skincare wardrobe'. Since, starting my Asian beauty journey I realized how dangerous sun exposure can be and how important sun protection is There is no better anti aging cream than a sunscreen (early prevention). I’m someone who loves the sun and spending some time on the beach, but now you will often find me in the shadow with a big hat, and of course at that moment there must be a water-resistant sunscreen for outdoor activities in my bag. 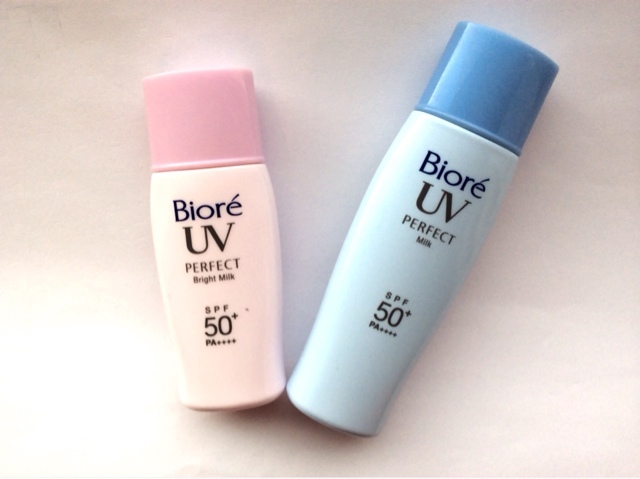 I reviewed the Biore UV Perfect Milk (for face and body) blue version before (link), which I really liked as a summer sunscreen in humid weather etc. The different variants of the Biore perfect line seemed to be identical but I still needed to try them out to compare. 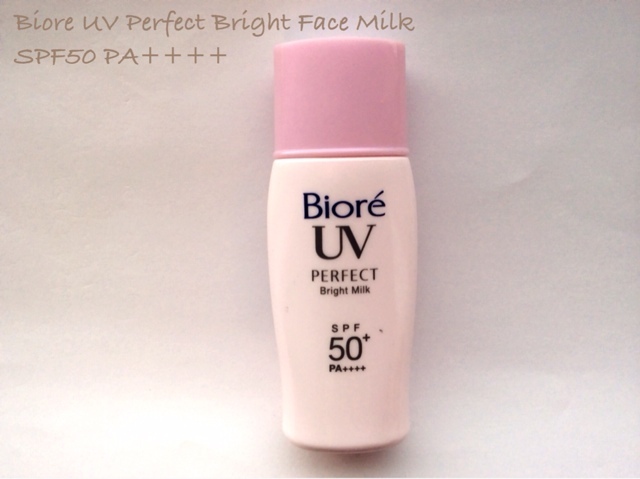 I got the pink version, the Biore UV Bright Face Milk spf50. 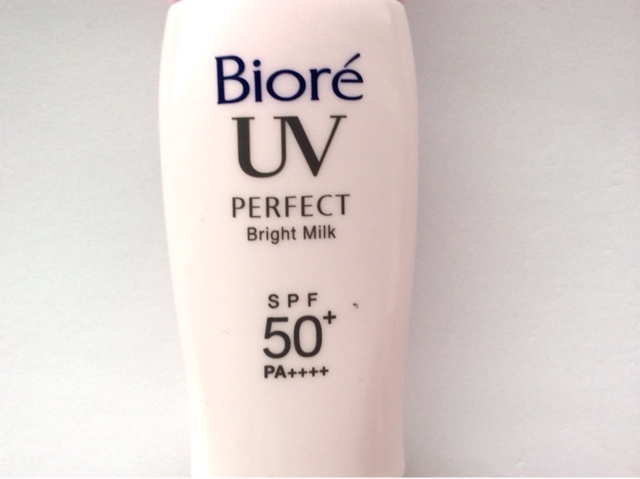 The Biore UV Bright Face Milk is supposed to be water, sweat and sebum resistant with spf50 and PA ++++. One difference between the blue and pink bottle is the amount, the blue has 40ml of product while the pink version has 30ml . The blue bottle is market as for face and body while the white and pink are only for face (it’s probably just a marketing strategy, you can use them for both for face and body).The pink bottle is the bright version, supposed to be brightening compared to the white version, as far as I know that’s the only difference. The sunscreen contains both chemical and physical filters. There appear to be no major red flags, I couldn’t translate the ingredients myself but did find the 2015 version on Cosdna (although, it’s made in Vietnam so probably there are some differences with the Japanese version). As with most Japanese sunscreens alcohol is high on the ingredient list, if you are very sensitive to alcohol this can be an issue. However, I find the alcohol very well formulated here and it doesn't irritate my sensitive skin and facilitates fast absorption. The pink bottle has a small opening, it’s the tiny little bottle typical for Japanese sunscreens. As the formula is quite runny the opening makes it easy to dispense the desired amount of product. There is 30 ml of products (again a Japanese thing), which I have to say is on the low side, most Korean sunscreens contain 50-60 ml of product. Dispense around 1/4 tsp on your palm and apply on your face and neck, apply 20-30 minutes before sun exposure as a last step of your skincare routine. The texture is liquid, its not white like other sunscreens having a beige-pink undertone (which you don't really see in the picture below). The color is actually the reason I went for the pink version instead of the white one, I hoped it would even out my skin tone and maybe add some brightening. The sunscreen is very lightweight and non-greasy, it actually creates a somewhat matte look, which is what I need on a hot day in the sun. The sunscreen doesn’t dry out my dehydrated skin, despite a matte finish. I suspect its my extensive skincare routine and dewy base/make up finish, that keeps my face hydrated. So, if you have very dry skin I would be careful with the Biore perfect sunscreens. Sebum control is very good, I didn't even need blotting paper on a hot day. There is a very light white cast after application, this doesn't bother me much as it disappears after 10 minutes. The reason why I don't like most western sunscreens is because they are sticky, leave a white cast and grease on the face. 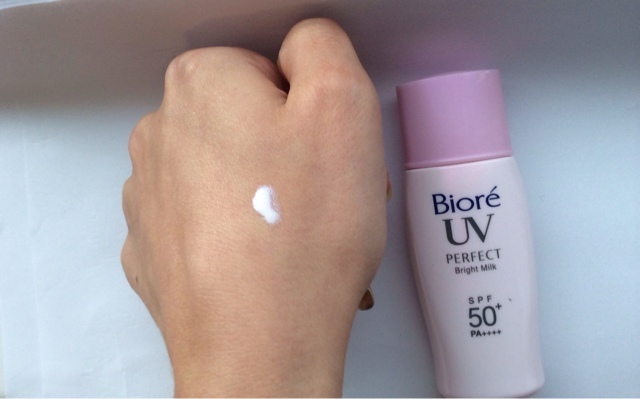 In contrast, the Biore UV Bright Face Milk is non greasy, with a matte finish and good sebum control. The sun protection factor is really good, I never burned while using this sunscreen. Keep in mind that you have too reapply regularly. So, is there a difference between the blue and this pink version? 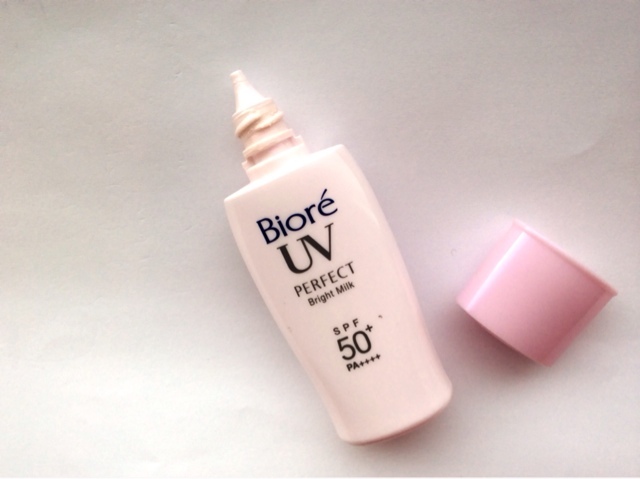 I found the pink Biore UV Bright Face Milk slightly less drying and better at evening out skin tone. 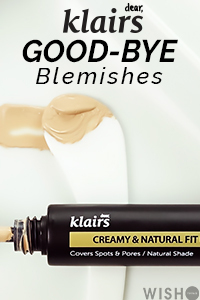 Can't say really if its brightening, it does cover pores a little bit end evens out skin tone. I like both version, but prefer the pink one slightly more. The only downside is that’s it not moisturizing and can even be drying, If you have dry skin and want a sunscreen with moisturizing effect, you can try the Biore UV Aqua Rich Watery Essence Sunscreen. All in all, again a very good sunscreen from Biore, I wore it for days in humid hot weather and on the beach without tanning. Its very lightweight, matte and forms a perfect base for make up. *This post contains an affiliate link marked with an asterix, shopping with it supports the blog.